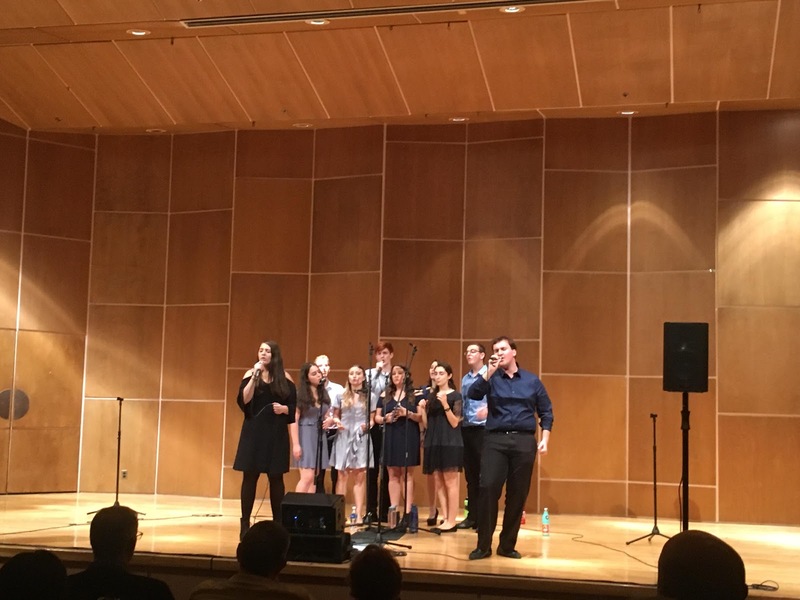 This university’s premier Jewish a cappella group, Kol Sasson, put on its final performance of the semester Sunday at Tawes in the Ulrich Recital Hall to nearly 50 students, friends, family and alumni. The talented group of 10 managed to make themselves sound like a much larger group throughout each song as they alternated solo performances and harmonized together. With Kol Sasson initially founded in 1997, the group has seen many students come and go over the years. The group recently finished recording its eighth professional album with Liquid 5th Productions, which will be released in the coming months. Kol Sasson has also had many students graduate over the years. Fifth-year elementary education major Leah Schatz was honored by junior English and theatre major, Sarah Hirsh. “Anytime we have a concert, we sing this song and invite our alumni to come and sing with us because Kol Sasson doesn’t end!” Schatz said. Freshman Molly Azrael and senior Matt Jacobson sing the final song of the event with an original mash-up of “Unsteady/Im Telech.” Mollie Higgins/Mitzpeh. Alumna Tali Feldman, who graduated in 2014, was in the audience and went on stage to perform the traditional song with the group. Feldman recently just moved back to the D.C. area within the last few months and said she was pleased that she was able to make the concert for the first time in the past three years. In March, Kol Sasson will go on their spring break tour to Philadelphia, the hometown of members Leah Schatz and Sammy Turk Tolub. Kol Sasson also will be competing in the eighth Annual National Collegiate Jewish A Capella Championship Competition called Kol HaOlam, which means “Voice of the World.” It will take place in March at Adas Israel in Washington, D.C. Numerous members of the group expressed that Kol Sasson is more than just an a cappella group. No Replies to "Kol Sasson closes semester with winter concert"